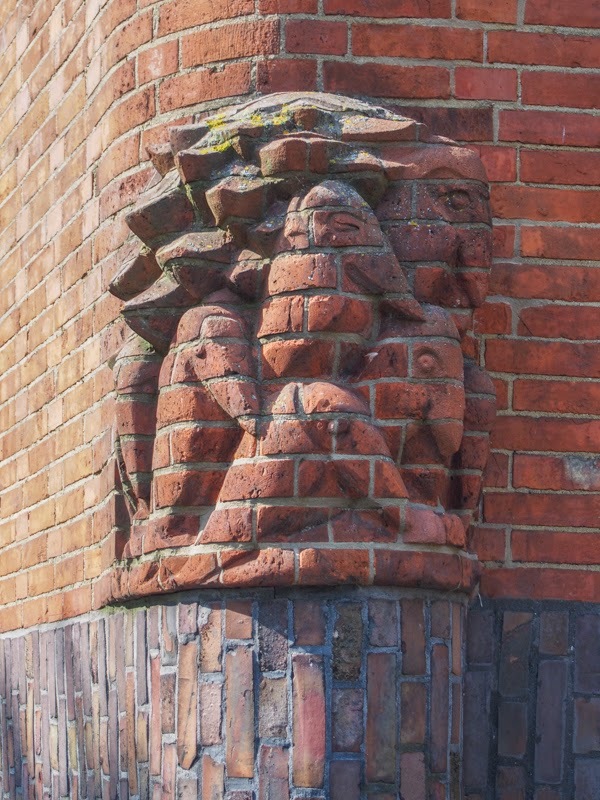 The Netherlands' only indigenous style of architecture in a museum and in the wild. 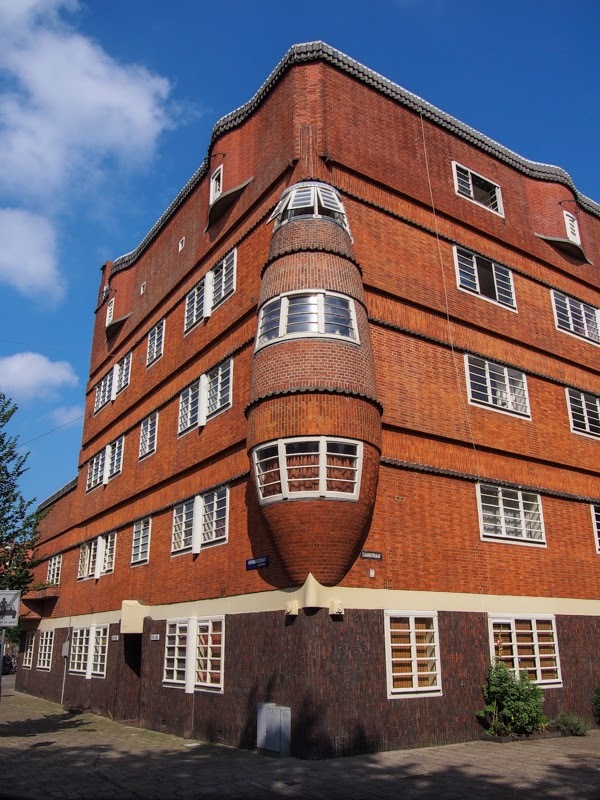 We all know why so many people are come to visit Amsterdam... for its architecture, right? Although you may associate the city with its 17th century canal houses, there is a wholly different style of construction which is unique to the city. 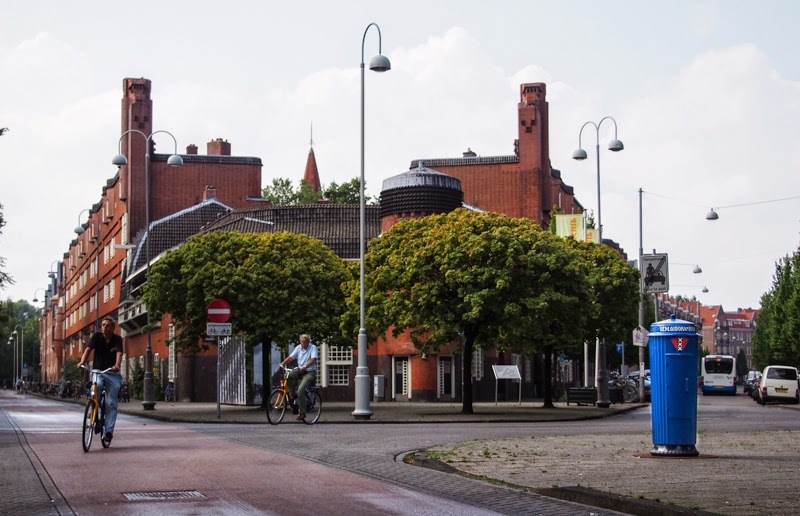 The Spaarndammerbuurt neigbourhood, cycling distance from the historic center. Map. 'Het Schip' (The Ship, in case you hadn't guessed) is the name of a museum, located in a building that was nicknamed you guessed it, 'Het Schip' by its inhabitants. 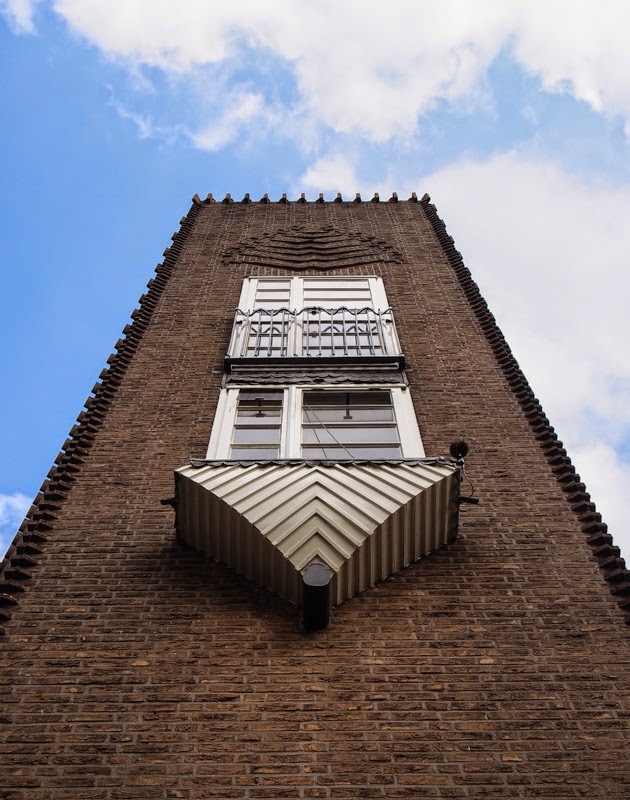 And the Amsterdam School (Dutch: Amsterdamse School) is a style of architecture that flourished in Amsterdam in the 1920's and '30's, with unique roots in the city. Museum 'Het Schip' is located in one of these gems of the Amsterdam School, a block of houses in the Spaarndammerbuurt neighbourhood. 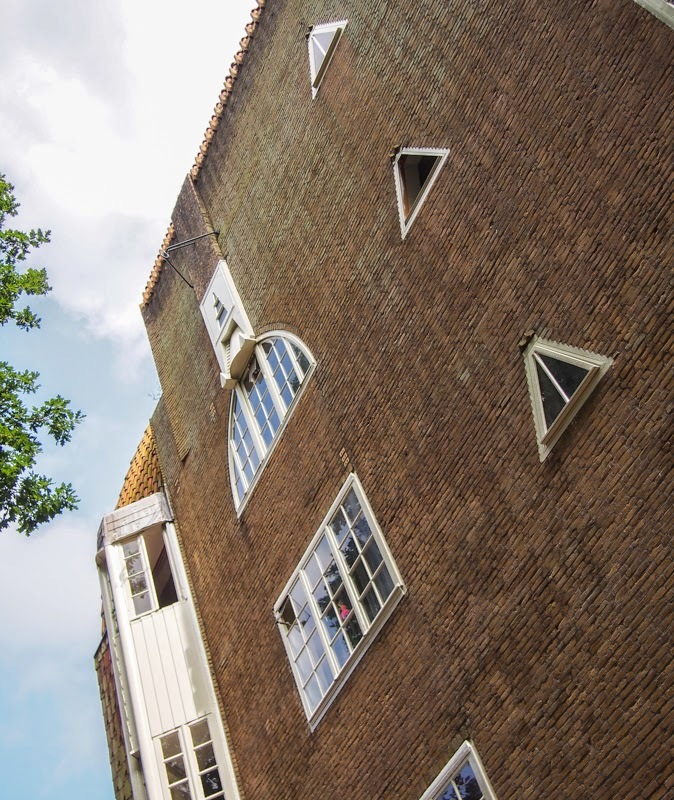 It's one of three blocks of houses which were all designed by the rebellious young architect Michel de Klerk and built between 1914 and 1921. The Amsterdam School was not just about looking good. 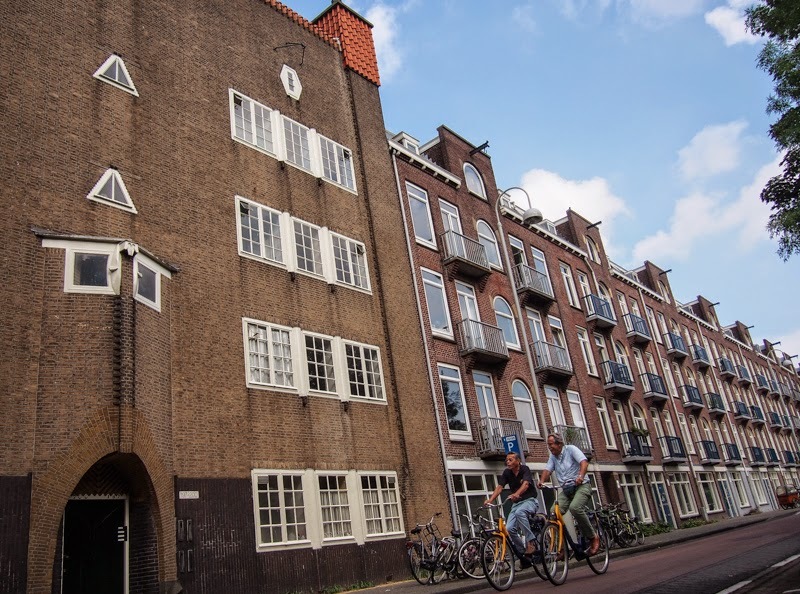 After the Industrial Revolution, Amsterdam was bursting at the seams with many new migrant workers who often lived in appalling conditions in slums and tenements. A law was passed in 1901 that aimed to provide safe and sanitary housing for blue-collar workers. Ambitious plans were drawn up and whole new neighborhoods designed. In line with the 'Proletarians of the world, unite!' theme, a fair bit of social engineering took place. No pubs were built near the houses, lest the proletariat entertained themselves with booze rather than the more wholesome activities (like a reading room) that were on offer. A giro bank system was set up to pay salaries, now that workers were no longer receiving their pay in the local pub. And a post office was provided for them to stay connected with the outside world (not unlike current day schemes to bring broadband internet to the rural poor). 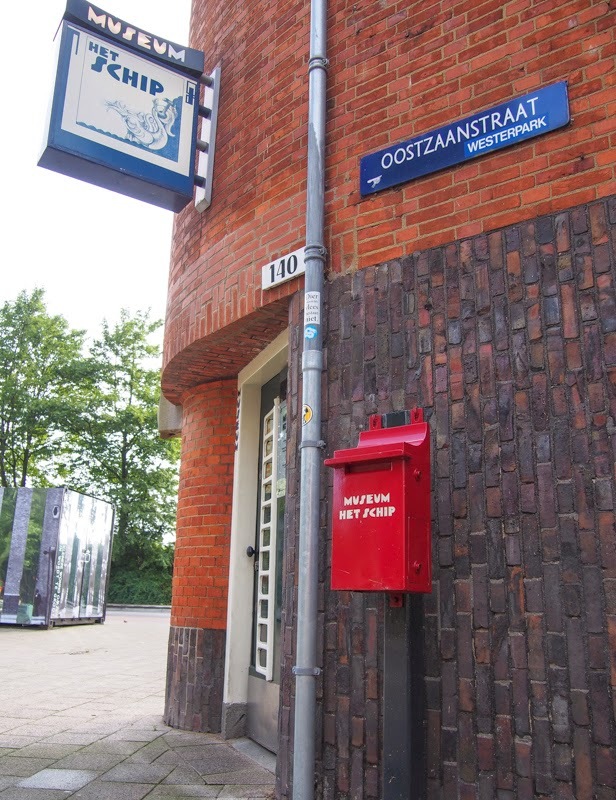 And because the Amsterdam School was aiming for a 360 degree 'beauty everywhere' experience, they designed postboxes and other paraphernalia, some of which can still be seen on the streets of the neighbourhood. 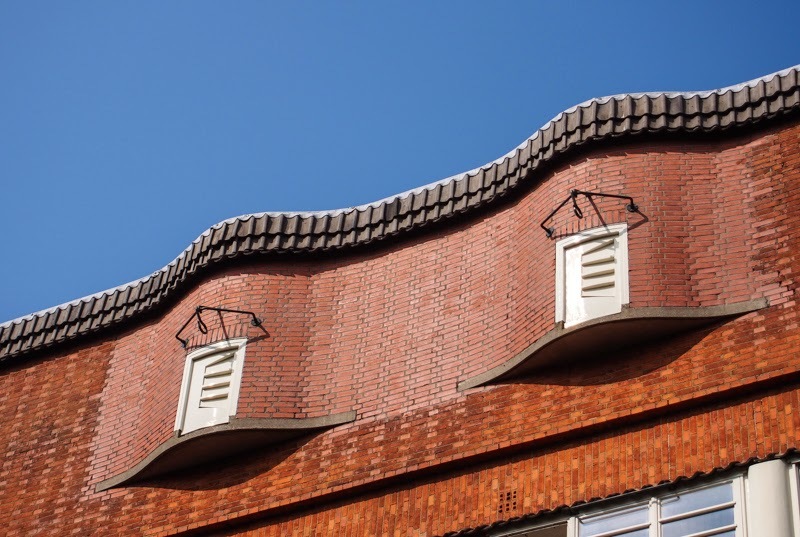 Stylistically, the Amsterdam School fills the gap between Art Nouveau, with which it shared a love for flowing organic lines inspired by nature, and the more minimalist geometric approach of Art Deco. 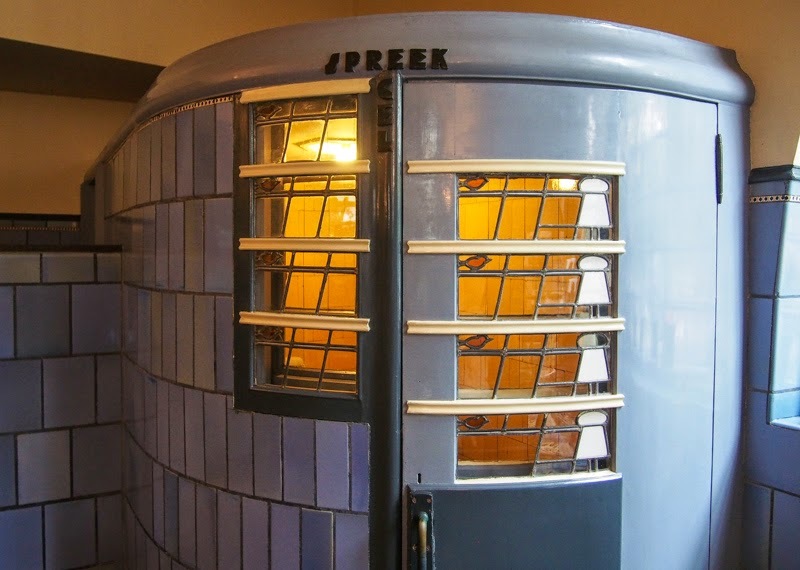 Later designs share much with Art Deco and can be seen as a Dutch interpretation of this international style. What is wholly Dutch are the building materials. Because this notoriously flat country lacks mountains and quarries, everything was built of mud, of which, thanks to copious quantities of rain that most visitors are familiar with, there is plenty. 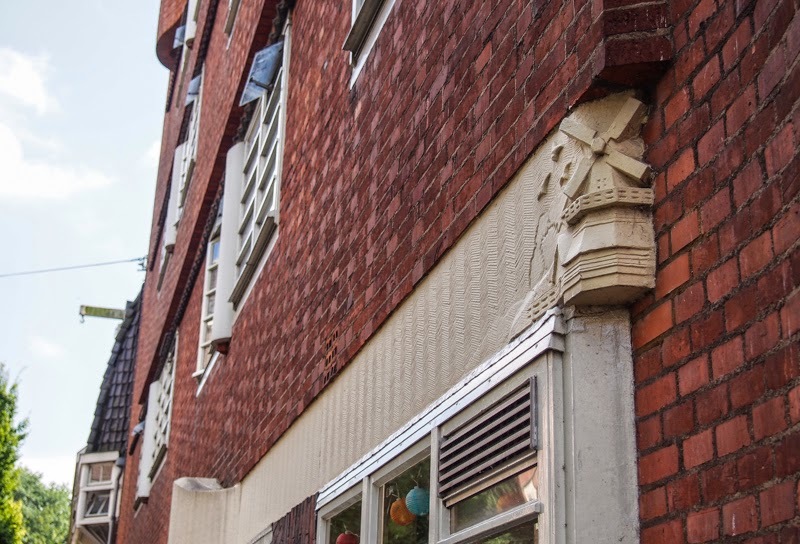 Having been baked and fired, the mud was turned into bricks which are the quintessential Dutch building material, and also honest and earthy (excuse the pun) enough to provide the street cred the socialist architects were looking for. 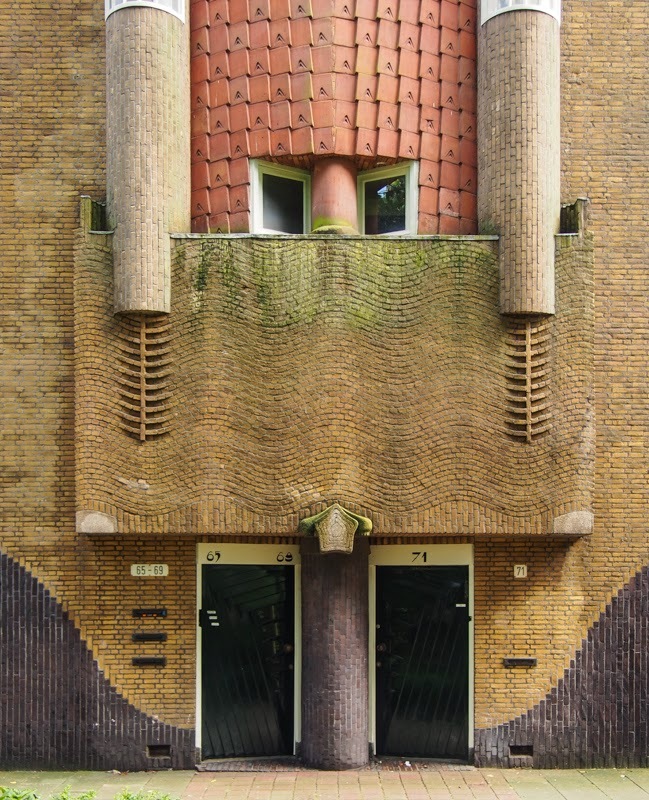 Bricks were used horizontally, vertically, diagonally, left, right and center, in various shades and colours, upside-down and inside-out, to create dynamic patters and 'plasticity' (a term widely bandied about when discussing the Amsterdam School, although nobody seems to know exactly what it means). 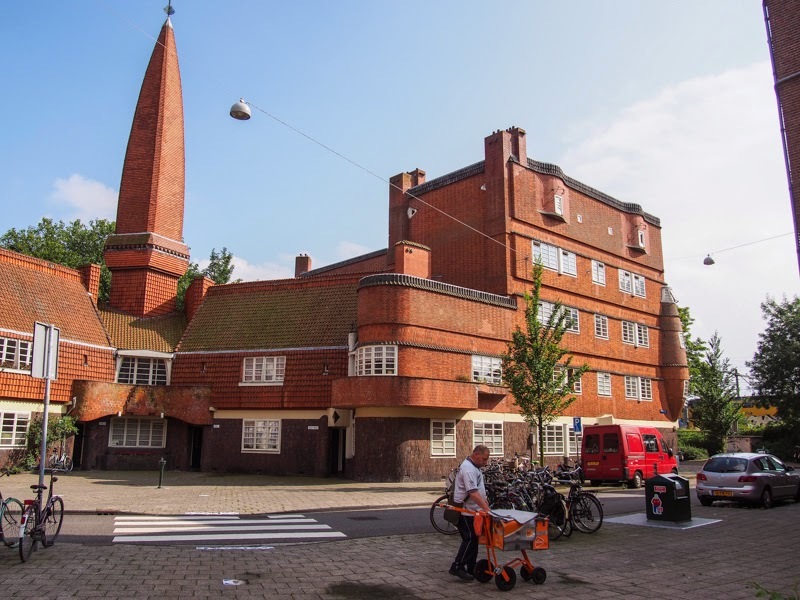 The Spaarndammerbuurt and Het Schip are not the only places in Amsterdam where you can feast your eyes on Amsterdam School buildings. There are jewels scattered all over town, mostly in the city extensions built in the 1920's like Nieuw Zuid. But Het Schip is one of the few places where you can see some of original interiors as well. A guided tour takes you through the post office designed by De Klerk, full of quirky designs. Look out for the phone booth featuring birds on a phone wire, and the strict Verboden! (No entry!) sign on a door that was off-limits to customers. This phone booth evokes an old telephone pole with its white insulators and twittering birds on the wires. Most locals thinks there's nothing more dangerous than a tourist on a bicycle. Still, if you're willing to brave it, Het Schip is only 10 minutes by bike from Central Station. Want to play it safe? Bus 22 will take you straight to the Museum from Central Station. 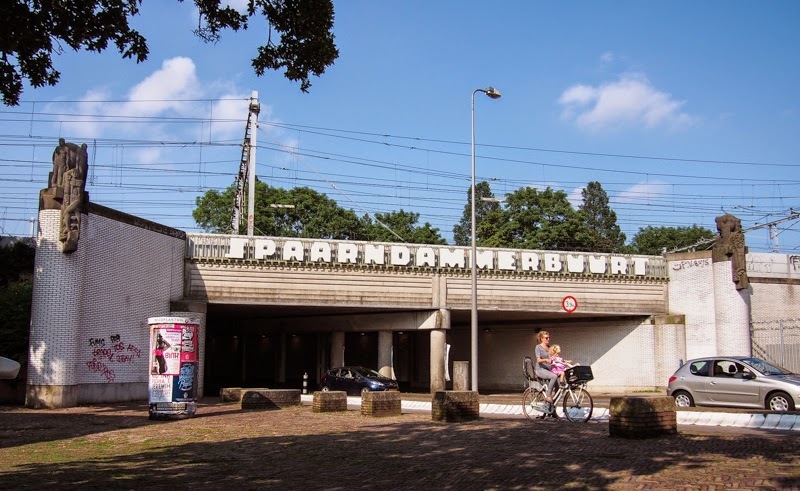 Entrance to the Spaarndammerbuurt neighbourhood- in Amsterdam School style.